>> What Are The Best Shoes Should You Wear During Pregnancy? After the first few weeks or a couple of months into your pregnancy chances are that you will start feeling or noticing some discomfort on your feet. Once this happens, you should know that it is time to review the shoe types that you are wearing. You will have to put away some shoes for the rest of the pregnancy and even buy new pairs that are comfortable enough for you to wear until you deliver. The Go Walk 3 is a modern looking slip-on shoe by Skechers that is perfect for ladies that like walking and also for those that are on the feet for many hours each day. This fantastic shoe comes in a slip-on design that makes it simple to wear, and it comes with a mesh fabric upper section to ensure maximum breathability and a rubber sole that will offer wearers and excellent grip. This shoe also has a Memory Fit design that entails giving it foam padding around the heel for a comfortable and custom feel. Apart from this it also has some special sensors that will offer ladies feedback and flexibility to ensure that they always get a fruitful walking session. Also, it is available in more than a dozen feminine colors, and this gives ladies an opportunity to choose something they like. The slip-on design makes the shoe very easy to wear even for pregnant women. It is available in more than a dozen feminine colors. The breathable mesh keeps this shoe cool and fresh all day long. Go Walk-3 comes with memory foam padding around the heel that gives it a custom fit. This shoe is lightweight, and this makes it perfect for wearing for many hours continuously. We love the fact that it has some sensors that offer feedback and flexibility to improve your walking experience. It is a lightweight shoe, and you will even forget that you are wearing it as you will not feel any significant weight. The synthetic/fabric and rubber sole make it a very durable shoe. They are not very suitable for using in wet environments. Most people will find them a little uncomfortable at the back before they get used to them. The extra padding means that the foot will sit a little higher and this is not always very comfortable. Ladies looking for the best shoes for pregnancy or something comfortable and stylish to wear to work should try this Emmie Ballet Flat from Lucky. It is a fantastic shoe that features a leather upper section, leather lining, and rubber outsole. The outsole also includes a heel that measures about a quarter an inch which makes it ideal for pregnant ladies and those that are on their feet for many hours. This fantastic shoe is available in numerous colors and patterns which mean that you can be confident of finding something that will match any outfit. It has a slip-on design, and so you will never have any trouble or waste a lot of time trying to wear it. Also, this casual flat shoe comes with a rounded toe, and the topline has a gentle elastic. We love the fact that is a genuine leather footwear because this means that it is very durable. The rubber outsole is also an excellent addition to the footwear as it offers great support and grip. It has a unique and classic ballet flat design. The quarter an inch heel is just right for most women including the pregnant ones. This shoe comes in a slip-on design that makes it comfortable and easy to wear. You can get it in numerous colors which mean that you can always get something to match your outfits. It does not require any break-in as it is comfortable from the first day. They are affordable, and so you can buy a few pairs in different colors. It is a glued and not stitched shoe, and so the outsole will not remain intact for long. The leather is high quality, but it is also quite thin. Although it is a comfortable shoe, the fit is not as perfect as most ladies would want. The Yoga Sling 2 Flip-Flops from Sanuk is a comfortable and stylish looking shoe that is perfect for summer and any other hot days. This shoe has an open design and flat sole which also makes them ideal pregnancy shoes for swollen feet. They come with fabric straps that will ensure that you do not always have to worry about blisters and they are wide and stretch enough to ensure they can fit ladies with wide feet. The front part or what ladies like to refer to as the "thong" is a fabric material, and this means that it will be gentle on the part of the foot between the toes. This shoe comes with a yoga mat footbed that is very comfortable on the feet and an EVA outsole to give you extra traction. Also, it is an affordable shoe that is available in dozens of colors. The shoe is available in dozens of color combinations. It has some fabric straps that are comfortable and very breathable. The padded yoga mat that forms the footbed is also very comfortable for the feet. As long as you choose the correct size, you can always be sure of an excellent fit. This shoe is very affordable, and we love this fact because it means that ladies can buy several pairs at a go. It has a cute design and looks stylish on the feet. Fabric straps are wide and stretch enough to ensure a comfortable fit for ladies with wide feet. The front part is a fabric material, and this makes the shoe gentle on the soft part between your toes. The flat design and fabric outsole do not offer a lot of support. It will not last for as long as most ladies would want. They are not ideal for wearing for extended periods, and this is more so when you are walking. Any woman looking for warm and comfortable boots to wear during the winter should go for this fantastic one from Kamik. 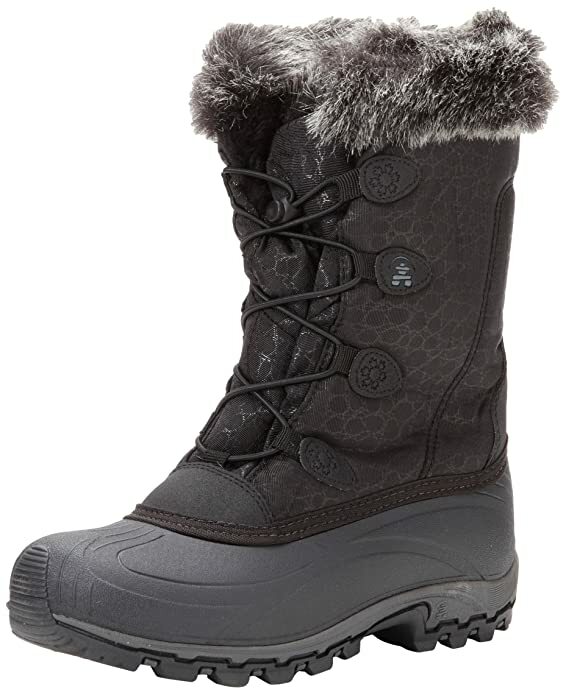 It is a modern boot that will keep the snow out while also ensuring that your feet remain warm and dry. This shoe has a synthetic upper and a 200g Thinsulate for insulation which is what keeps your feet warm and dry. This beautiful snow boot comes with a faux-fur collar and a gusseted tongue to prevent snow from getting into the footwear. It has a unique bungee lacing that makes it simple to wear, and the shaft is about ten inches from the arch to the collar. The footbed in the boot is removable, and it has a special treatment the keeps odors in check. Also, the outsole is rubber, and it will give you maximum traction and grip when in the snow. These snow boots have a durable synthetic material. They are waterproof and also warm enough for winter. The shaft is long enough to ensure maximum protection for your feet. This shoe has a quick bungee lacing that makes it effortless to wear. It comes with a rubber sole with a heel that measures an inch, and it gives you excellent traction and grip when walking on snow. There are more than a dozen colors available. It is a sturdy boot that is very effective in keeping your feet dry. The footbed is removable, and it also has an anti-odor treatment. There are quite challenging to wear with most jeans types. The elastic laces do not appear durable. They are not available in half sizes, and this means that some people will not get a perfect fit. Also, they are ideal for snow, and when you want something waterproof but not as stylish shoes, that you can wear over the weekend. 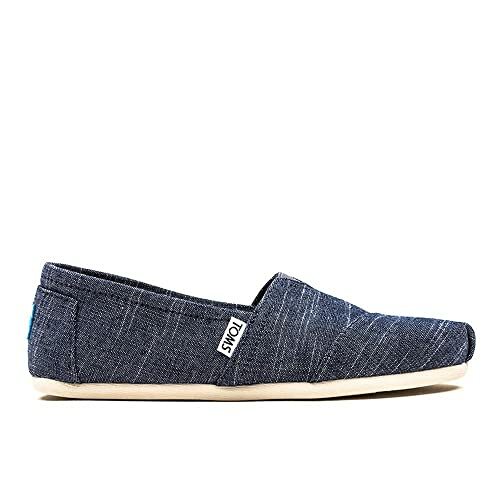 TOMS is famous for making some fabulous slip-on shoes and so even before you buy this one you can be confident that it is a high-quality pair. It comes in more than 30 colors, and so a lady can be confident of finding a shade that she likes or matches her outfits. The shoe has a breathable canvas upper with a unique toe stitching. This lightweight shoe also comes with a synthetic outsole that has an incredible traction and is thick enough to shield the feet from the pressure that comes with walking or standing for many hours. The footbed is a suede leather material that provides light cushioning, and it also includes a textile lining that is very breathable. You can choose a pair from more than 30 different colors. Canvas is a durable and breathable material. They have a slip-on design to make them easy to wear and remove. It is a lightweight shoe, and this makes it ideal for wearing all day. This slip-on shoe has some cute prints on the upper section that makes it look stylish. They are an affordable pair of slip-on shoes. This classic shoe will not require any break-in as it is comfortable from the box. The sizes are slightly off for some people. If you are looking for something with arch support this shoe will not work for you. The stitching needs some improvement as it is not very high-quality. The discomfort and pain that you get from wearing regular shoes when pregnant are enough to show that you need to change them. But, most mothers will tend to find themselves in a dilemma on what type of shoe they should wear during these crucial months. Clogs are comfortable to wear, they have good ventilation and are also versatile, but most also have rigid soles and tapered toe boxes which can be uncomfortable. Flats are not hard to wear, and they also go well with most outfits, but their demerit is that they do not offer a lot of support or cushioning. Sandals have a good ankle support and are also simple to wear, but they will not provide protection from the elements or warmth. The three shoe types are still the best for pregnancy, but you will need to choose brands that offer the most advantages and maximum comfort. There is always debate on whether it is suitable for pregnant women to wear heels or not during pregnancy. Different individuals including experts seem to have varying opinions about this issue but in most instances, the demerits of wearing heels appear to outweigh the merits. Wearing heels regardless of how comfortable they feel is a bad idea because of the increase in weight, body shape changes and the alteration of your center of gravity. All these changes and the decreases in your coordination ability and balance mean that you are at a high risk of falling during pregnanc﻿﻿y. Wearing heels increases the likelihood of falling which can lead to injuries to you and the unborn child. Also, experts associate wearing heels with everything from back pain to calf cramps. As you are planning or preparing for your pregnancy, you should always remember to buy the right shoes. Whether it is your first time to conceive or not, choosing the right footwear is never easy because everything feels uncomfortable. But, this should not be the state if you consider the following important things when buying your pregnancy shoes for swollen feet. Any shoe that you choose to wear during your pregnancy should offer you enough support and cushion. The change in your feet and the extra weight that comes with pregnancy means that your legs will need additional arch support. A proper arch support will not only make your feet less painful but will also help to prevent injuries from the excessive strain on the feet. The best idea is to try out a few pairs and pick what you find supportive enough. Whether you plan to take regular walks during the nine months or just lazy around you still need comfortable shoes. Everything from the cushioning to the style of the shoe will affect its comfort. And so you should not just go for something stylish just because of its look, and you should instead try it out and determine whether it is comfortable. If it is a closed athletic style shoe things like the tongue and collar will also affect its comfort. Your feet will sweat a lot during pregnancy because of the hormonal changes, and so you need something breathable. Sweaty feet will not only make you feel uncomfortable, but they lead to a bad odor which no pregnant woman will want on her feet. Ease of wearing the shoe matters a lot during pregnancy because you cannot bend as usual. Slip-on are the best shoes for pregnancy due to their ease of wearing. You will not need to spend a lot of time wearing this type of shoe, and in some instances, you can even wear them from a standing position. Also, they do not have laces that you have to keep fastening, and this also reduces the risk of tripping on the shoelaces. Ladies will always go for shoes with a perfect fit as they find them comfortable but this is not the case with pregnancy. Your feet will swell a lot due to the increase in weight and other biological changes, and in most instances, they will expand by up to a full size. And so you have to be keen with the size so that the shoe is comfortable. The footwear that you choose to go with during the nine months of pregnancy is vital as it will influence the experience that you get during your pregnancy. Going for something comfortable, breathable and roomy enough is the best decision that you can make as it will make things easy for you and your unborn child.